Devotees visiting the Sabarimala Temple carry with a specially designed bag with two compartments called Irumudi Kattu. I need to know more about that which is followed for many years. Can any one please explain? There is very good explanation on Haringo.com blog. This url is the source of following information. Following part is borrowed from there with sincere thanks to the website. Irumudi Kattu means two packages. The front pouch is meant for Lord Iyappan, this pouch contains the Ghee coconut (Nei thengai) and all the pooja items needed when we reach Sabari mala. The back pouch carries all the items we will need on the way for ourself. The front pouch cannot be opened until we reach Sabarimala, the back pouch can be opened on the way. The most important item carried in the irumudi kattu is the ghee coconut (Nei thengai). The ghee coconut symbolizes the devotee himself who is carrying the irumudi. It is said the coconut represents ones body and the ghee represents ones soul. You carry yourself to be offered to Iyappan and carry back what is gives back to you. That is the reason you offer the ghee for Iyappan Abishekam and put the empty coconut in the burning fire. You can carry your ghee coconut and also of others from your family. They have to fill the coconut during the Irumudi kattu. Apart from this basic info, there are reasons as to what is the purpose, and contents of 2 compartments. There is also another reason why people carry ghee in a coconut. It is said ghee is taken to offer to Iyappan and to keep it from spoiling we seal it in Coconut. These are the two meanings I have come across. Irumudi as said before is two packs. It can be made of a single piece of cloth from which each side can be made as a carrying pouch by tying it. More often we use Irumudi bags that is readily available. This has two pouches from the same cloth with the opening facing each other. 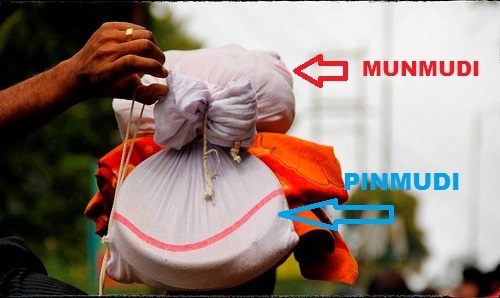 When you buy your Irumudi bag, also buy the coconut bags along with it if it is not sold along with the Irumudi bag. These are small cloth pouches which can be fastened using the rope that runs along its rim. Coconut for Nei thengai (Ghee coconut): This has to scrapped and polished. One of the eye has to be cleared and also dig in to the pulp with a sharp object until you can have the water drained out. This has to be done few hours before the Irumudi kattu as the coconuts have to be dried before filling the ghee. Rice: To be filled by the person carrying the Irumudi. While filling the rice, you also need to put the money that you are offering to Iyappan. After filling the rice, the ghee coconut is dropped in the bag. Vibudhi (Sacred ash). This will be used to form a heap on which the camphor will be lit to open the ghee coconut. This Vibudhi will then be taken back home as prasadham. What you do after opening the Pin Mudi? You empty the rice and money content. You will offer it to the respective hundial. Agarbathi, Kumkum and Aval are for Malangugapurathu amman. Camphor is for performing the Poojas. You take a small quantity of rice and raisins back to you home with which you prepare and offer pongal as prasadham. You can step on the sacred 18 steps in Sabari mala only if you are carrying a Irumidi on your head. Irumudi has to be carried only if you have completed your 41 days of fasting. If you are not carrying a Irumudi, you can take a different steps that runs on the side to reach the shrine. You can still visit the shrine without the Irumudi Kattu. Not the answer you're looking for? Browse other questions tagged temple pilgrimage ayyappa .